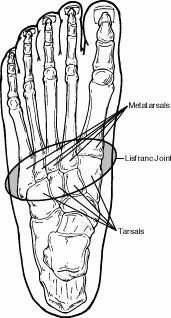 Injuries to the Lisfranc joint most commonly occur in automobile accident victims, military personnel, runners, horseback riders, football players, and participants of other contact sports. 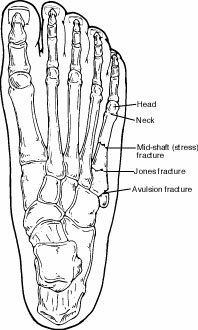 Lisfranc injuries occur as a result of direct or indirect forces to the foot. A direct force often involves something heavy falling on the foot. Indirect force commonly involves twisting the foot. This can happen, for example, when the foot catches on a stirrup while falling from a horse. Lisfranc injuries are sometimes mistaken for ankle sprains, making the diagnostic process very important. To arrive at a diagnosis, the foot and ankle surgeon will ask how the injury occurred. The surgeon will examine the foot and determine the severity of the injury. Anyone who has symptoms of a Lisfranc injury should see a foot and ankle surgeon right away. If unable to do so immediately, it is important to stay off the injured foot, keep it elevated (at or slightly above hip level), and apply a bag of ice wrapped in a thin towel to the area every 20 minutes of each waking hour. These steps will help keep the swelling and pain under control. Surgery. Certain types of Lisfranc injuries require surgery. The foot and ankle surgeon will determine the type of procedure that is best suited to the individual patient. Some injuries of this type may require emergency surgery.